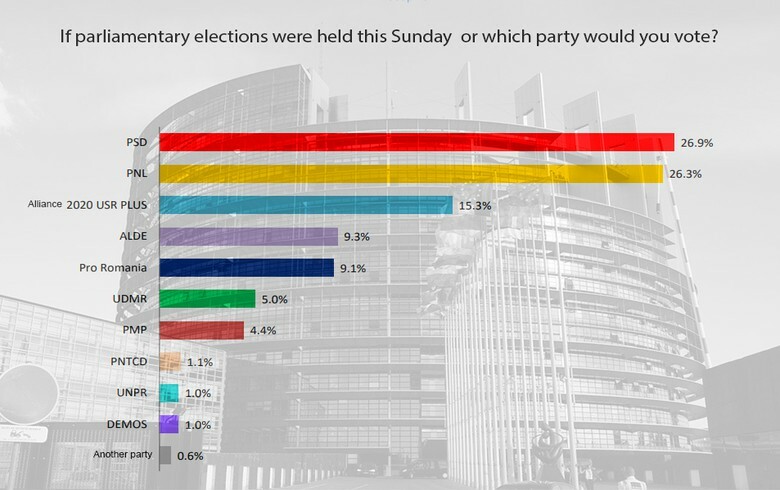 BUCHAREST (Romania), March 22 (SeeNews) - Romania's Social Democratic Party (PSD) and the Liberal Party (PNL) would get most votes in the elections for European Parliament in the country if the vote was held on Sunday, public opinion surveys showed. Of all Romanians who have made up their mind how they will vote, representing 58.5% of the poll sample, some 26.9% intend to back the PSD and 26.3% will support the PNL, a poll conducted by INSCOP Research for Konrad Adenauer Foundation showed on Thursday. The 2020 Alliance comprising the Union Save Romania USR and PLUS Party would get 15.3% of all votes, while the junior partner in the ruling coalition, the Liberal-Democrat Alliance (ALDE), would get 9.3% of votes. Pro Romania party would collect 9.1% of votes, while the Democratic Alliance of Hungarians in Romania (UDMR) would get 5%. Some 26.9% of the poll respondents said they will certainly vote in the May 26 elections, while 11.8% said they are determined not to vote. The survey was conducted by INSCOP during March 5-13. The sample consisted of 1,053 respondents aged 18 and older and eligible to vote. The margin of error does not exceed 3%. Another poll released earlier this week by INSCOP showed that Romanians are growing more and more pessimistic about their country's development but increasingly optimistic about Europe's future. Some 72.8% of the respondents believe that Romania is heading in the wrong direction versus only 17.8% who hold the opposite view. On the other hand, most respondents (46.7%) believe that Europe is moving in the right direction, as compared to 35% who hold the opposite view. Compared to the results of polls conducted in February 2019 and November 2018, there is a visible rise in optimism regarding Europe's future, INSCOP data showed.